A research team led by APS Assistant Professor Kunio M. Sayanagi has been awarded a research grant to use the Hubble Space Telescope to observe Uranus. Their results were previewed during the American Astronomical Society’s Division of Planetary Sciences meeting in Tucson, AZ, and a press release was issued by the University of California, Berkeley. 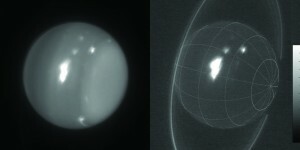 Infrared images of Uranus (1.6 and 2.2 microns) obtained on Aug. 6, 2014, with adaptive optics on the 10-meter Keck telescope. The white spot is an extremely large storm that was brighter than any feature ever recorded on the planet in the 2.2-micron band. The cloud rotating into view at the lower-right limb grew into the large storm that was seen by amateur astronomers at visible wavelengths. Imke de Pater (UC Berkeley) & Keck Observatory images.